What Are Secondary Market Sovereigns? Why Are Secondary Market Sovereigns So Cheap? Why Should I Pay If The Sovereigns Are Not In Stock? When Will I Get My Sovereigns? Can I Sell My Sovereigns? Can I Collect My Sovereigns? Well, the cheapest way to buy gold sovereigns is to buy our secondary market sovereigns. These are our lowest premium sovereign coins which are the best choice for investors wanting to buy sovereigns at the lowest price. Basically, a secondary market sovereign is a second-hand sovereign which is sold at a low margin above the gold spot price. They can be called pre-owned, second-hand or secondary market sovereigns. They may feature any monarch, from Victoria Young Head to Elizabeth II. We think it is a great way to combine investment gold with numismatic interest. These British gold coins may have some small scuffs, edge knocks or show signs of wear. If a coin has been in jewellery, is polished or damaged we would either sell this as Grade C sovereigns or scrap it. They are bought and sold close to the intrinsic metal value. The buying/selling spread is low making it a great opportunity for investors to buy cheap bullion sovereigns. 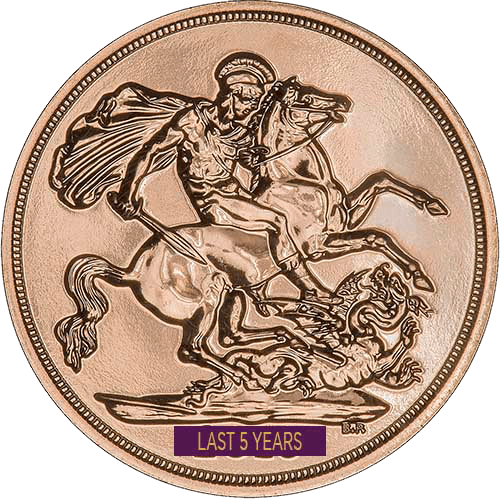 The customer benefits from being able to buy low priced gold sovereigns. 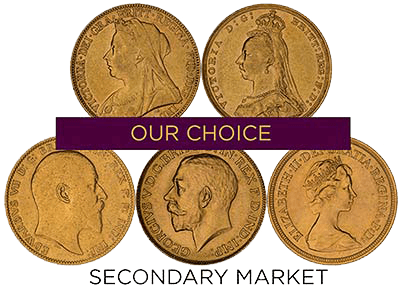 Our secondary market sovereigns are our cheapest gold bullion sovereigns that we sell. Take advantage of the quantity breaks to pay a lower price per coin. The more that you buy, the cheaper the coin. Whilst we often have hundreds of secondary market sovereigns in stock, there may be occasions when we are sourcing coins to fulfil orders. If you are not sure whether to old or new sovereigns, read our blog New v Old Sovereigns – Which Are The Best Buy? Basically, you are fixing the price on the sovereigns when the live gold price suits your requirements. If you only order when the secondary market sovereigns are in stock, you may miss out on a low gold price. We buy and sell sovereigns on a daily basis. If your sovereigns are in stock, we will automatically dispatch your order. If they are not in stock, we will phone you to let you know there may be a delay. If we cannot give a timeframe for the delay we will arrange to email you on a regular basis with updates on your order. We do not offer refunds on bullion items - this includes secondary market sovereigns. However, you can sell the coins back to us at the live gold price, or change your order to a different product that is available for immediate delivery. Even though you haven't received your coins, you still own them. You can sell them back to us at the live gold price, call our showroom to fix the price. You can see the live buying price on our Sell to Chard page. Yes, we have a showroom where you can come and collect your order – and save on delivery charges. Customers often like to see where we are and what we do, they are often pleasantly surprised to see where we are and what we do. If you do come to visit us, please remember to bring two forms of ID and if you have paid by debit card, please bring this card with you. Do you have any other questions regarding secondary market sovereigns? Call us on 01253 343081 and we will be happy to answer. If you want to buy the cheapest gold sovereigns, click this link here.